An upgrade part for Marui-style VSR-10 style Bolt-Action Airsoft Sniper Rifles and similar like the Well MB0X series. Produced by Action Army this is a high quality adapter piece that is made to last. It connects a barrel extension or airsoft mock suppressor to the barrel by adding an -14mm threaded tip to the barrel end. 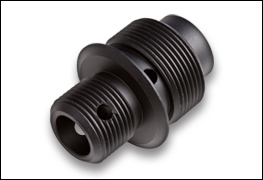 Simply this adapter into the threaded barrel of the barrel and screw the barrel extension or mock supressor onto the other end.